The city of Grimes a shared by both Polk County and Dallas County and is part of the Des Moines-West Des Moines Metropolitan Statistical Area. The city was named after James W Grimes and incorporated as a city in 1894. Grimes is known for its many recreational areas. Waterworks Park is the main part of the city, but there are quite a few other sports parks, baseball fields, soccer fields and playgrounds available. The local school district draws students from Polk and Dallas County. The main high school and junior high school are located just outside of Grimes. Local middle and elementary schools as well as kindergarten are located within the city limits. 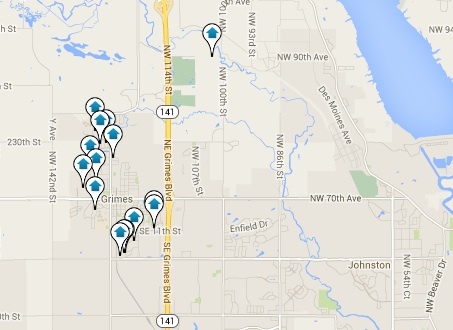 Homes in Grimes are predominantly single-family units. Over 80 percent (80.7 percent) of residents are homeowners with 33.7 percent renting. The market for homes has steadily increased over the last few years with home values going up 1.9 percent over the last 12 months. The median home value is currently $179,300 in Grimes at this time. The city has also seen an increase in the price per square foot, which is currently hundred and $41. This amount is higher than the Des Moines Metro average of $118. The overall median price of homes currently listed is $233,000 and the median sold price is $174,706. There is every indication that this market will continue to rise slowly in value.